甄梅楠, 代政, 常璨, 马成仓, 刘春光. 硼和氯化钠复合胁迫对小麦幼苗的影响[J]. 农业资源与环境学报, 2015, 32(4): 418-422. ZHEN Mei-nan, DAI Zheng, CHANG Can, MA Cheng-cang, LIU Chun-guang. Combined Effects of Boron and NaCl on Wheat Seedlings[J]. Journal of Agricultural Resources and Environment, 2015, 32(4): 418-422. Abstract:To investigate the combined effects of boron(B)and NaCl on the growth of wheat, a pot experiment was conducted using wheat (Triticum aestivum Linn.)seedlings. 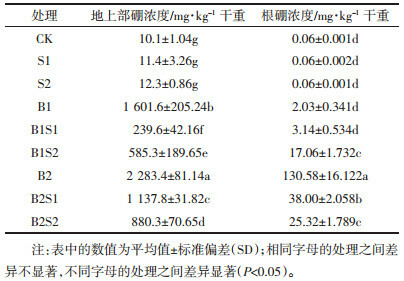 Boron concentrations of culture medium were set as 0, 50 mg·kg-1 and 100 mg·kg-1, and NaCl concentrations were 0, 1 g·kg-1 and 2 g·kg-1. The results showed that both boron and NaCl could significantly inhibit wheat growth. 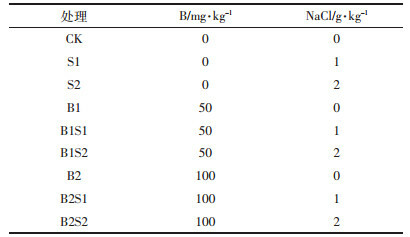 At 50 mg B·kg-1, NaCl aggravated growth inhibition caused by boron. At 100 mg B·kg-1, however, NaCl alleviated the inhibition caused by boron. The combined stress of boron and NaCl significantly increased the root to shoot ratio of wheat. NaCl inhibited the uptake of boron by wheat. It suggests that under severe boron stress, NaCl is able to alleviate boron toxicity in wheat by increasing root to shoot ratio and reducing boron uptake. Camacho-Cristóbal J J, Rexach J, González-Fontes A. Boron in plants:Deficiency and toxicity[J]. Journal of Integrative Plant Biology, 2008, 50 (10):1247-1255. Stangoulis J C R, Reid R J. Boron toxicity in plants and animals[M]//Goldbach H, Rerkasem B, Wimmer M A, et al. Boron in plant and animal nutrition. Springer US, 2002:227-240. Mittler R. Oxidative stress, antioxidants and stress tolerance[J]. Trends in Plant Science, 2002, 7(9):405-410. Rerkasem B, Jamjod S. Genotypic variation in plant response to low boron and implications for plant breeding[J]. Plant and Soil, 1997, 193(1-2):169-180. Greenway H, Munns R. Mechanisms of salt tolerance in nonhalophytes[J]. Annual Review of Plant Physiology, 1980, 31(1):149-190. Grieve C M, Poss J A. Wheat response to interactive effects of boron and salinity[J]. Journal of Plant Nutrition, 2000, 23(9):1217-1226. Yau S K, Ryan J. Boron toxicity tolerance in crops:Avaible alternative to soil amelioration[J]. Crop Science, 2008, 48(3):854-865. Alpaslan M, Gunes A. Interactive effects of boron and salinity stress on the growth, membrane permeability and mineral composition of tomato and cucumber plants[J]. Plant and Soil, 2001, 236(1):123-128. Bastías E I, González-Moro M B, González-Murua C. Zea mays L. amylacea from the Lluta Valley (Arica-Chile) tolerates salinity stress when high levels of boron are available[J]. Plant and Soil, 2004, 267(1-2):73-84. Yadav H D, Yadav O P, Dhankar O P, et al. Effect of chloride salinity and boron on germination, growth, and mineral composition of chickpea (Cicer arietinum L.)[J]. Annals of Arid Zone, 1989, 28(1-2):63-67. Edelstein M, Ben-Hur M, Cohen R, et al. Boron and salinity effects on grafted and non-grafted melon plants[J]. Plant and Soil, 2005, 269(1-2):273-284. Yermiyahu U, Ben-Gal A, Keren R, et al. Combined effect of salinity and excess boron on plant growth and yield[J]. Plant and Soil, 2008, 304(1-2):73-87. Bingham F T, Strong J E, Rhoades J D, et al. Effects of salinity and varying boron concentrations on boron uptake and growth of wheat[J]. Plant and Soil, 1987, 97(3):345-351. Holloway R E, Alston A M. The effects of salt and boron on growth of wheat[J]. Crop and Pasture Science, 1992, 43(5):987-1001. Wimmer M A, Goldbach H E. Boron-and-salt interactions in wheat are affected by boron supply[J]. Journal of Plant Nutrition and Soil Science, 2012, 175(2):171-179. Masood S, Saleh L, Witzel K, et al. Determination of oxidative stress in wheat leaves as influenced by boron toxicity and NaCl stress[J]. Plant Physiology and Biochemistry, 2012, 56:56-61. Maas E V, Grattan S R, Skaggs R W, et al. Crop yields as affected by salinity[M]//Skaggs R W, Van Schilfgaarde J, et al. Agricultural drainage. American Society of Agronomy, 1999:55-108. Magnani F, Mencuccini M, Grace J. Age-related decline in stand productivity:The role of structural acclimation under hydraulic constraints[J]. Plant, Cell and Environment, 2000, 23(3):251-263. Szaniawski R K. Plant stress and homeostasis[J]. Plant Physiology and Biochemistry, 1987, 25(1):63-72. Seemann J R, Critchley C. Effects of salt stress on the growth, ion content, stomatal behaviour and photosynthetic capacity of a salt-sensitive species, Phaseolus vulgaris L[J]. Planta, 1985, 164(2):151-162. Stiles A R, Bautista D, Atalay E, et al. Mechanisms of boron tolerance and accumulation in plants:A physiological comparison of the extremely boron-tolerant plant species, Puccinellia distans, with the moderately boron-tolerant Gypsophila arrostil[J]. Environmental Science & Technology, 2010, 44(18):7089-7095. Brown P H, Bellaloui N, Wimmer M A, et al. Boron in plant biology[J]. Plant Biology, 2002, 4(2):205-223. Ismail A M. Response of maize and sorghum to excess boron and salinity[J]. Biologia Plantarum, 2004, 47(2):313-316. Schnurbusch T, Hayes J, Sutton T. Boron toxicity tolerance in wheat and barley:Australian perspectives[J]. Breeding Science, 2010, 60(4):297-304. Bañuelos G S, LeDuc D, Johnson J. Evaluating the tolerance of young hybrid poplar trees to recycled waters high in salinity and boron[J]. International Journal of Phytoremediation, 2010, 12(5):419-439.